Pinkadots Elementary : What's Inside My Teacher Bag...Linky! 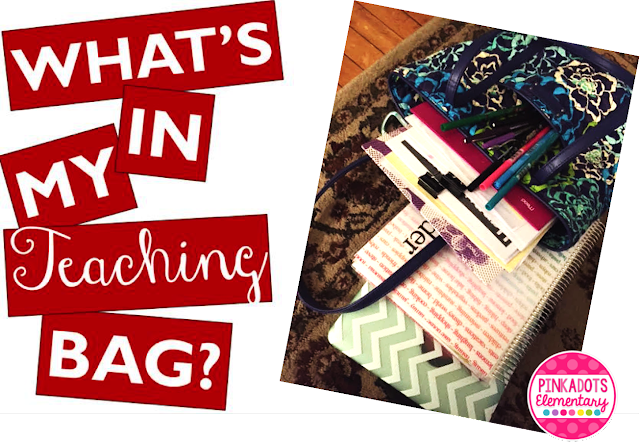 What's Inside My Teacher Bag...Linky! I am so excited to participate in this fun link up that Tammy came up with about the contents of teacher bags. I have a little teacher bag that holds EVERYTHING I need. Sometimes I feel like Mary Poppins because it is like a bottomless pit! My husband does not believe what I pull out of it every night! I will start out by giving a shout out to my BBB, Jessica, who sent me this gorgeous blue Vera teacher bag and some awesome school supplies! Thanks girl! Like many of you all, I am a school supplies hoarder. I love pens, pencils, markers, notebooks, paperclips, etc. You name it, I can find a way to use it...as long as it's pretty! So here it is....my teacher bag! Markers, pens, mechanical pencils, and fun writing utensil. Can't wait to see what is inside of the other teacher bags in this linky so be sure to link up. Now if this was what is inside my desk, you'd be here all night reading! I love your last comment about if this was your teacher's desk! hahaha. I don't think I would ever want to go there. At the end of the year when I have to straighten it up a bit, I'm always surprised by the strange things I have in it! lol. Thanks for linking up!